Without a doubt, the biggest thing we did this year was our partnership with sonnen to create the first Energy Automation System. Announced at CEDIA in September, this puts PanTech Design and ADAPT at the forefront of an exciting new category in the home automation industry. In a world increasingly affected by climate change, an aging energy infrastructure, and a shift to cleaner renewable energy sources, intelligent management of power consumption will become critical in the coming years. PanTech Design and the ADAPT platform are uniquely positioned to be a leader in intelligent energy storage and management. Leveraging Crestron automation hardware and the ADAPT software, ADAPT works with sonnen’s ecoLinx smart battery system to store energy when it is cheaper, reduce consumption at peak times, and readies homes for significant weather events that could knock out power for a sustained period of time. If a power event occurs, the system can also prioritize what’s important to the homeowner – like refrigeration for food – over other systems, assuring that stored power is used wisely to get through the outage. ADAPT can even access weather data over the Internet, decide that a power event is highly likely, and instruct the sonnen system to intelligently store and use auxiliary power. This is why we’re calling it the Energy Automation System, and it’s revolutionary – it will only get smarter over time. 2018 also saw the launch of ADAPT 2.0, which adds requested new features and continues to improve on the customizability and ease of programming and Crestron automation systems. Among the enhancements are increased maximum room and device counts for improved scalability, support for Crestron’s TSR-310 remote, and of course the all new Energy Automation Module to add the exciting new energy management capabilities. Check out the ADAPT 2.0 in-depth webinar for much more technical detail. We’re always interested in better ways to get our customers up and running with ADAPT. To that end, we launched ADAPT University, which puts together a series of videos with comprehensive training for programmers. While we still do interactive training, the video series lets our customers train at their own pace and at times that are convenient to them. The videos are hosted on our new ADAPT University YouTube channel. 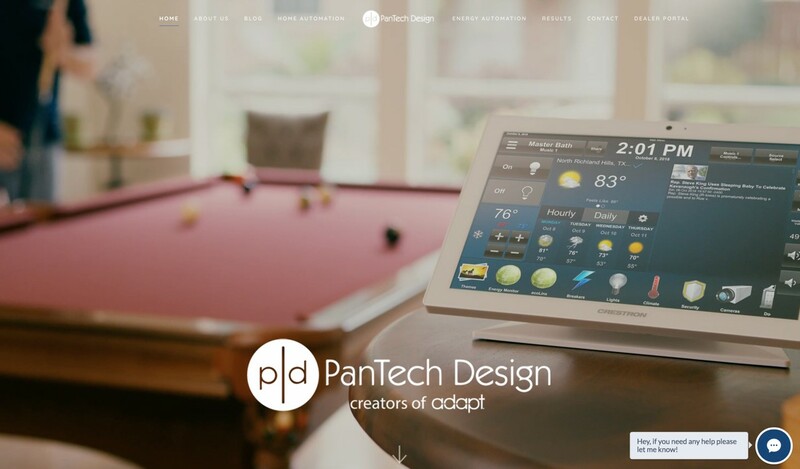 Anyone can view them, and moreover, you can get a feel for the power of ADAPT in combination with a live demonstration from the PanTech Design team prior to joining the ADAPT family. 2018 also brought the debut and total redesign of our website launched after CEDIA. The site features our new energy automation solution, modern design, and bold new animated graphics and imagery. The new graphics also serve an important purpose. We are able to better show the incredible user interface customization that is possible with ADAPT. While the video shows several options for UIs the possibilities are exponential and it’s impossible to show everything. One of the differentiating features of a Crestron system is its customizability, and we have made it so easy to design beautiful UIs with ADAPT. With many home automation systems, UI customization is limited, and navigation is relatively fixed. ADAPT can help you customize the interface to your customer’s liking. While you’re here reading this blog, check out the new UI graphics and get a feel for the variety of designs. Besides the flashier graphics, we’ve organized resources such as downloads, training videos, and ADAPT Chat in an easily accessible location. We’ve also added a section that showcases customer testimonials and success stories. We’re love seeing the amazing projects our customers build using ADAPT and the homeowner’s excitement with their new system, and while we enjoy the great reviews, we’re always striving to make the product better and do even more. Here’s to a great 2019! If you want to learn more about the power of ADAPT, please contact us; let’s start the dialog.